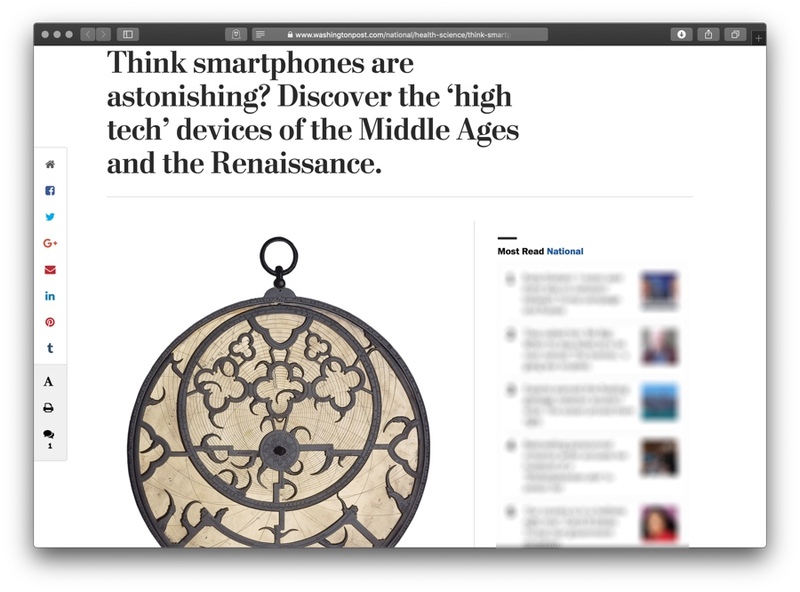 Last month the Washington Post ran a short article by Erin Blakemore on medieval scientific instruments, “Think smartphones are astonishing? Discover the ‘high tech’ devices of the Middle Ages and the Renaissance.” It was a little light on details, but nicely highlighted Epact, an on-line collection of pre-modern scientific instruments. It is easy while away a bit of time browsing the collection. Erin Blakemore‘s recent article on Epact and pre-modern scientific instruments. Since the article was illustrated with a Sloane astrolabe from the British Museum, I thought I’d draw attention to another great resource: The Astrolabe: An Online Resource. The website gives you access to every astrolabe in the History of Science Museum’s collection, which is the largest single collection of astrolabes in the world. 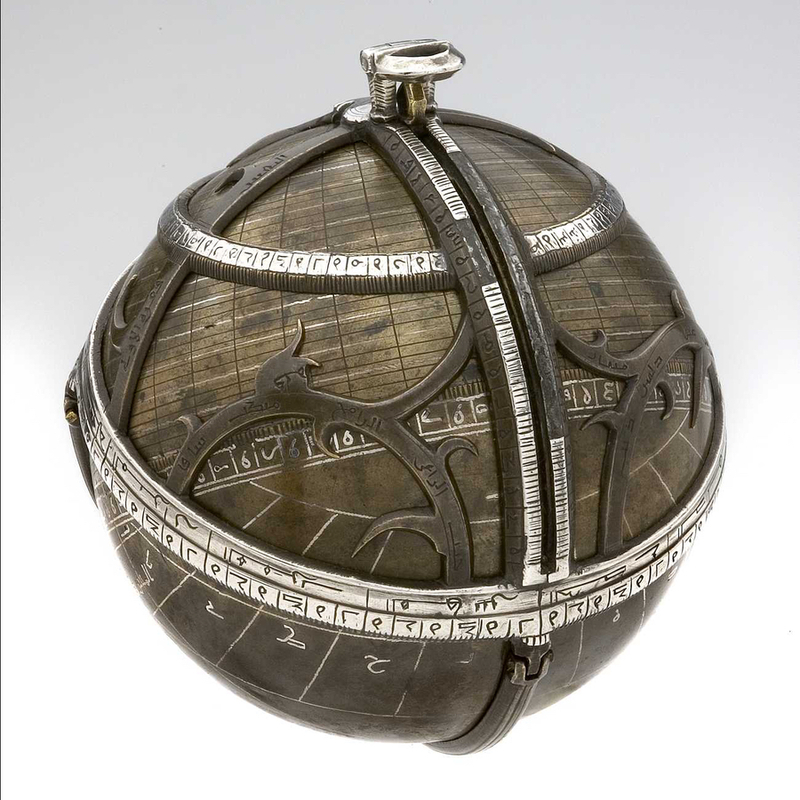 Astrolabes in the collection range over a millennium and much of the Northern Hemisphere, from the late 9th-century Syria (one of the oldest surviving astrolabes) to the 20th-century England. Most of the instruments date from the pre-modern period. While perhaps not the most flashy of websites, it is probably the single best resource for studying astrolabes. 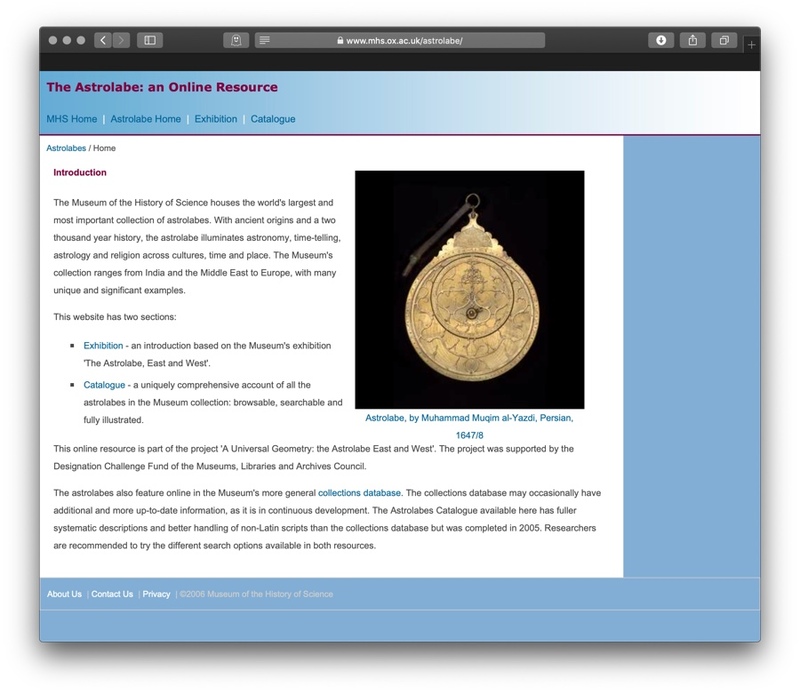 The Astrolabe: An Online Resource is the best collection of astrolabes available. The only (known) surviving spherical astrolabe. It’s truly beautiful.